You are at:Home»Society»Crime»May 23, 1934: Bonnie and Clyde Shot to Pieces in Police Ambush! May 23, 1934: Bonnie and Clyde Shot to Pieces in Police Ambush! On May 23, 1934, waiting policemen ambushed notorious robbers and murderers Bonnie Parker and Clyde Barrow, filling them and their stolen car full of holes. Bonnie was not quite 24 years old and Clyde was only 25, but at the time they were the most famous outlaws in the United States. Blazing a trail of crime from 1932 to 1934, the couple and their gang had robbed about 12 banks, many stores and gas stations and had killed 9 police officers and a handful of civilians in the process. Both of these career criminals were born in Texas, and they died together (of course) in Louisiana. During their crime spree, Clyde’s use of a Browning Automatic Rifle (BAR), a .30 caliber one-man machine gun turned the tide of battle in a couple of shootouts with police, and the gun became his trademark. Bonnie had been arrested for robbery at one point but was released weeks later for lack of indictment. On another occasion, the police (who do learn from mistakes) were armed with a BAR and machine guns when they attempted to ambush the pair in November of 1933. Although Bonnie and Clyde escaped, both were wounded in the legs as they drove away. Clyde planned and executed a prison breakout for some of his gang members and other prisoners in Texas in January of 1934, and this insult to Texas law enforcement seemed to precipitate a renewed eagerness to catch or kill the criminal pair. Killing more highway patrolmen contributed to the enthusiasm for the blood of Bonnie and Clyde, and public opinion swung decidedly against them as newspapers published false and embellished accounts of Bonnie’s supposed bloodthirstiness. Fate caught up to the murderous duo on a country road in Louisiana on May 23, 1934 as 6 officers (4 from Texas, 2 from Louisiana) set up an ambush and blasted the pair when they rolled up in a stolen car. About 130 rounds were fired by the cops, with at least 25 hitting Bonnie and Clyde apiece. Of course, they died right there and without any medical attention. In the aftermath of the massacre, the police present grabbed souvenirs for themselves, including the large cache of guns in the car, Clyde’s saxophone and the car itself. The car’s owner did successfully reclaim her property, but Clyde’s father was unsuccessful in getting the guns turned over to him. His logic was that Clyde had not been convicted of a crime, and therefore the guns should not be seized! Bonnie and Clyde are remembered in movies, made-for-television films, books and in a number of songs. 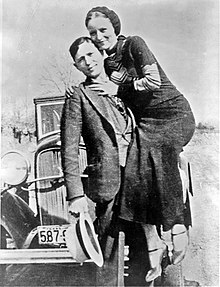 On May 23rd each year there is a Bonnie and Clyde Festival held at the scene of the fatal ambush. See you there! Gills, Michael. The Death of Bonnie and Clyde and Other Stories. Texas Review Press, 2011.